New Rosehip Oil Basket wrapped in cellophane and tied with a bow. Makes a beautiful gift for any occasion. 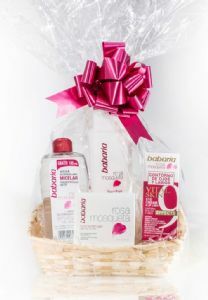 This basket contains Rosehip Oil Micellar Water, Rosehip Oil Cleansing Milk, Rosehip Oil Anti Wrinkle Face Cream and Rosehip Oil Eye and Lip Contour Cream. Rosehip Oil Micellar Water - Babaria’s Micellar Cleansing Water with Rosehip Oil has become a beauty superhero, combining gentle and effective cleansing in one clever product. It effectively cleanses your face, removes make-up and unclogs pores with minimum effort. Skin is left feeling clean, instantly refreshed and hydrated without irritation. Perfect even for sensitive skin. Rosehip Oil Cleansing Milk - This deliciously light, milky formula with Musk Rose Oil comfortably and thoroughly cleanses the skin. Ultra gently it sweeps away all makeup and impurities leaving your skin feeling smooth and pampered. This cleansing milk is suitable for all skin types. The Musk Rose Oil, helps to firm the skin whilst the Extract of Camomile, Mallow, Witch Hazel, and Lime work together hydrating calming and keeping your skin soft and smooth. Rosehip Oil Anti Wrinkle Face Cream - Babaria Rosehip Oil anti wrinkle cream with its unique tightening effect is designed to be used twice daily. This remarkable moisturiser with Musk Rose oil helps restore and improve the quality of skin tissue. This daily moisturiser which is rich in omega 3,6 and 9 essential fatty acids helps to minimise the look of lines and wrinkles and strengthen skin’s resistance to the environment. In short, look younger, longer. Rosehip Oil Eye and Lip Contour Cream - New Eye cream and Lip liner 9 effects , anti ageing, wrinkle reducing. Active ingredients have been combined to combat nine signs of ageing. It acts as a muscular relaxant, thus delaying the formation and growth of wrinkles. Reduces the depth of crows' feet. Smooths the skin to achieve a more youthful appearance. Apply day and night, on the contour of the eyes and lips by gently massaging until it is completely absorbed. For best results, apply to the eyes from the inside corners to the outside.